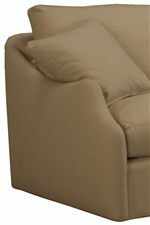 This extra large chair and a half and ottoman set is designed for the two-fold purpose of comfort and style. A large upholstered seat cushion with a plush padded comfort, gives the chair from this set an edge over relaxation with a wider seat cushion for a sprawled-out comfort. 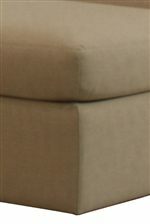 Complementing the seat cushion with an additional element of comfort is the padded footrest top with a plush padded comfort. Elegant arms with a decorative tapered flair, give this chair and footrest set a formal furniture element while a no-foot look provides an endless flow from floor to seat back. Pair this set with its coordinating sofa or use it as an accent in a casual styled room. The 1086 Extra Large Chair and a Half and Comfortable Ottoman Set by McCreary Modern at AHFA in the area. Product availability may vary. Contact us for the most current availability on this product. 1086-O2B Ottoman and a Half 1 43" 26" 17"
1086-C2B Chair and a Half 1 48" 43" 37"
The 1086 collection is a great option if you are looking for Casual furniture in the area.